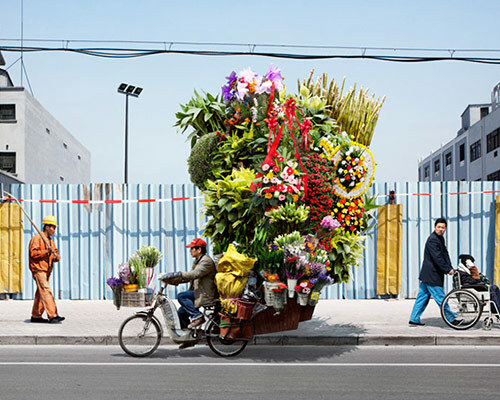 french photographer alain delorme‘s newest series of photographs is entitled ‘totems’. the images were captured during two art residencies (supported by ailing foundation) de lorme participated in shanghai throughout 2009 and 2010. fascinated by migrants’ loads, he has photographed piles of stacked ‘made in china’ products which form unusual sculptures, symbols of a form of fetishization of the objects themselves. the verticality of these formations echoes the incessant expansion of the urban area, constantly under construction. here, de lorme gives a new vision full of humor and poetry of those porters – both super heroes and ants with impressive loads of tires, water containers, office chairs, flowers… distanced from the typical photos of china portraying immense crowds, he has focused on the individuality of these workers, as opposed to all those identical and interchangeable objects. photoshop or not, that’s not the point at all. SUPERBE ! The message is all there ! I think we’re kind of missing the point of these photographs! How incredible is it that these men and women continue to transport large piles of ‘stuff’ in this manner?! That in itself is an art – being able to balance all these things in such a way that still makes it possible to bike or pull by rickshaw. The environment in which this is happening in the context of the rest of the world makes such an impact. Beautifully captured as well. Wonderful! Yep, photoshop. The weight alone on a couple of the loads would have popped the tires on those small bike wheels. I wood if I could but I can’t, so I will not even try. I like very much – wonderful power lines. Creating pictures this considered, well composed and seamless in Photoshop is a craft. Not only that but do it over again to create a body of work that where each image stengthens and compliments the last is a skill only an artist can achieve. Photoshop is a medium just like paint and clay. For those that doubt the talent of the creator – download a trial copy and lets see the results. Right on nobody you know, well said and anyone who can’t get that message is the fake screaming fake. the other day i saw a guy carrying so much styrophoam he’s pile was higher than the bus and the trucks next to it! We always like to see what we want to see. and the first one with flowers? on the bike? no tricycle? Pardon me, while tricycles can be seen all around China carrying a lot of stuff but these photos are a result of photoshop. It is ok if the creator wants to ave some fun – but please do not make people believe that these are real photos. To all the “techy” criticism: Take a critical theory course. fake or real.. i love it. Cameras lie and so do photographers. Of course it matters if these are fake or not. Look at all of the writers lately who have been completely discredited because of fabrications that were not necessary to make their case. It would have been harder to find people carrying incredible loads–to do it in Photoshop is just lazy.